Albany Court provides a range of smaller industrial units/workshops and a newly constructed office block. The first floor office space is occupied as the headquarters of PMW Property. 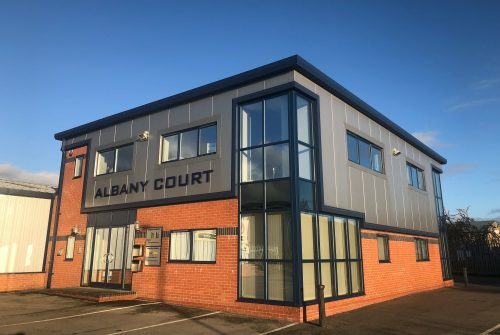 Albany Court has been within the ownership of PMW Property for many years with a range of small industrial units to the rear of the site and a newly constructed office unit to the front of the site. Albany Court is located on the popular Airfield Industrial Estate and the first floor office became the new HQ for PMW Property in 2011 when they relocated from their previous location as part of the owner’s Bradley Hall residence. The new offices were completed to a very high specification. The units to the rear are occupied by a number of local businesses and PMW Property were, once again, delighted to welcome Howdens Joinery in 2012 to another one of their units when they moved in to one of the warehouse units.